StreamMe recently opened its doors to #SupportTheStreamer. They offer an amazing alternative to other streaming services to give opportunities to the new streamer. Their biggest focus is to be involved in the eSports scene, working alongside some of the best in the Fighting Games Community as well as branching out to organizations like us! When we looked at StreamMe, we wanted to see what really makes them different and why they stand out as the new home for streamers to get their start. After looking things over and speaking with staff from StreamMe, we found it as a new home for BxA Streaming. The two biggest things that sets StreamMe aside from all the rest is their partnership process. Other websites require thousands of viewers and followers before they will even consider you, but StreamMe stays true to their cause of supporting the small streamers. Once you hit 50 followers and have a streaming schedule, you can apply for a subscriber button. What is awesome about this is they give you a 70/30 split to better support your streaming career. On top of that, you can name your price! Your subscribers can cost anywhere from $1.00 to $4.99!. Visit their website at https://stream.me, and be sure to follow them on Twitter @StreamMe for all future updates! Good Luck Have Fun (GLHF) is Jacksonville, Florida’s first all-in-one geek/nerd/gamebar. They have consoles, computers, classic arcade games, tabletop games, and more! Feeling famished after fragging? They have craft cocktails, craft beers, and unique gaming inspired food! All right on the river in downtown Jacksonville, FL. GLHF also is hosts a variety of events including Thursday night weeklies for the Fighting Games Community, Monthly tournaments called Revival for the Fighting Games Community, Overwatch tournaments, CS:GO tournaments, Release parties for major games such as Dragon Ball FigtherZ coming up on January 26th, and much more. Into playing MOBA’s, go down to GLHF on Monday nights for FREE to play any MOBA style game (League of Legends, Heroes of the Storm, DOTA 2, Smite, etc.). Bored on a Wednesday night, head out to GLHF for Free To Play Wednesday from 6:00pm until 10:00pm. This includes all consoles and PCs! Anyone playing on a console station will be required to have a running tab of food or drink. This is to help increase our turnover rate for those just coming in to try out some of the awesome games on our list. This also gives new customers coming out to try GLHF for the first time a better chance at getting a spot to enjoy our Game Bar. Join us and remember the “Golden Rule” here, Good Luck, and Have Fun! GG is a 0 Calorie Energy and Focus Formula created by Gamer Supps LLC. The goal of Gamersupps is to offer eSports athletes and everyday gamers a healthy, more effective, and cheaper energy option than anyone else in the industry. After consuming a full serving of GG, it will take about 10-15 minutes for the desired effects to kick in. And depending on how many servings you take (you should start by taking just 1), the increase in Energy and Focus can last between 5-6 hours! The best part is… unlike sugar-loaded canned energy drinks, there’s NO CRASH, just a smooth ride until you are back to the way you were before you drank it. All of their products are completely open label so you can know exactly what you are putting into your body. GG is gluten free, calorie free, crash free, filler free, & sugar free! if you have any questions feel free to contact them on Twitter:@GamerSupps. 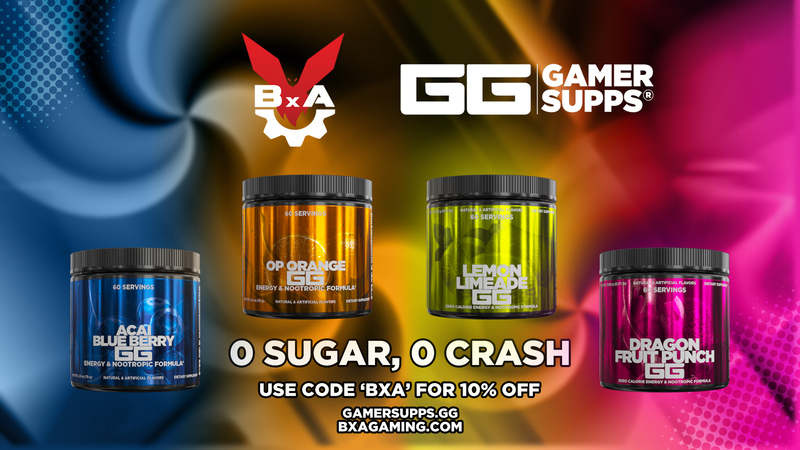 Visit their website at: http://gamersupps.gg?afmc=BxA. Check out their website today! Become apart of the #GGarmy! Use discount Code: BxA to save 10% off your order. 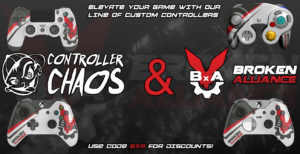 Controller Chaos opened for business in early 2008 to fill a void we saw in the gaming world – quality modded controllers. As gamers ourselves, our goal wasn’t just to provide our customers with quality controllers that were outfitted with all the latest technology, we strove to provide gamers with the largest selection of modded controllers AND back it with the industry’s top customer service and technical support. We also employ the industry’s leading customer service team to respond to any issues and help make you a 110% satisifed customer. To us, gaming is serious business! 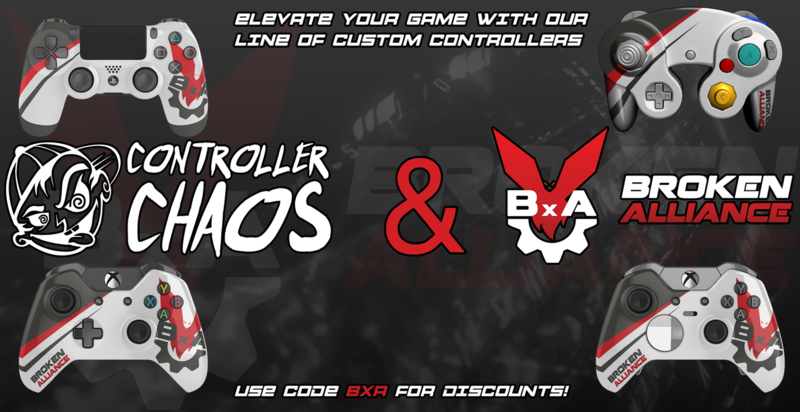 Visit their website at: http://www.controllerchaos.com/.Follow them on Twitter @ControllerChaos and on Facebook at: https://www.facebook.com/controllerchaos.